The gaffers are gaff-rigged boats which look superficially like small working boats. There is great variation in the fleet, no two are alike. 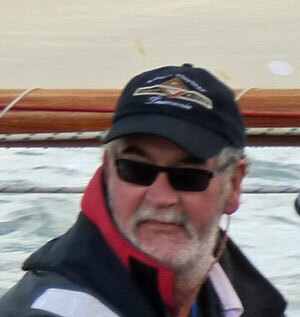 The 'Restricted 18s' are also gaff rigged, and while they compete during Falmouth Sailing Week, they do so in their own class, and they are rarely seen racing at Flushing, welcome though they would be. 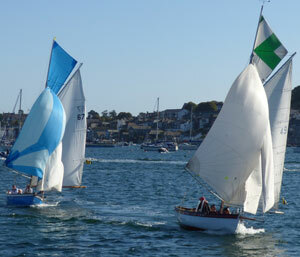 The gaffers also have a number of 'special' races each year: the 'backwards races' where they sail from the Cub up towards Penryn and back down. These races have to be fitted in with appropriate tides. It would be embarrassing to be stuck on the mud-flats of Penryn! 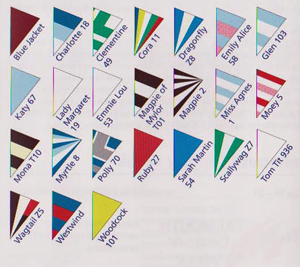 The list below includes gaffers who are 'known' and who race from time to time in either the Falmouth Classics or Village Regattas. The list of all those gaffers who sail at FSC is given here. These handicaps issued 11th August 2017. Like the Working Boats, most of the gaffers also sport distinctive topsails. There is no convenient on-line guide, but the PoFSA Sailing Calendar which is issued annually usually contains images of the topsails.